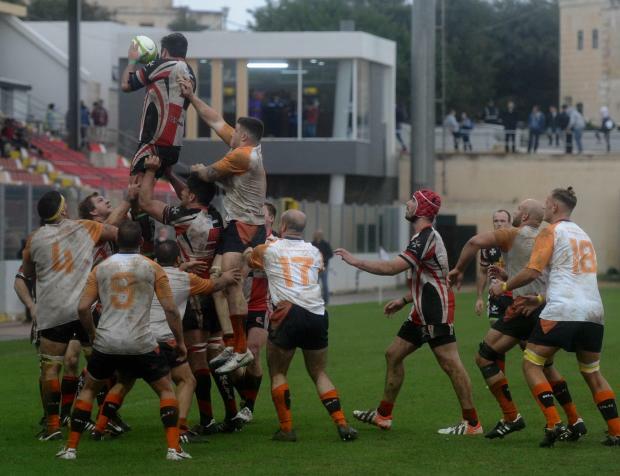 The Malta rugby national team bagged their second successive victory in the Conference One South when they brushed aside Cyprus 31-3 at the Hibs Stadium. The first half saw the Maltese dominate proceedings but it was Cyprus who broke the stalemate courtesy of an Alex Zavallis penalty. But the hosts fought back and they went ahead when Daniel Holliday touched home the team’s first try following a driving maul and James Morris kicked in the conversion. On the restart, Malta were in complete control and five minutes from restart, Thomas Holloway stole possession and released James Kirk who scored the second try which was converted by Morris – 14-3. Kirk struck again on 52 minutes when touched the ball at the far right corner a powerful incursion by Rhodri Apsee as the Maltese led 19-3. Malta’s ascendancy was hindered when Luke Watts was sin binned, leaving the team with a player less for the next 10 minutes. Cyprus were on the ropes and substitute Rory O’Brien picked up a short clearance to run over the line for Malta’s hosts fourth try – 24-3. In the closing changes, Neill made a raft of changes but that didn’t stop the team from rubberstamping their victory with a fifth and final try scored by Dragan Cerketa and converted by Morris for a resounding 31-3 victory. Malta: R. Apsee, D. Holliday 5, A. Harvey, D. Deguara, M. Davey, L. Watts, D. Apsee, J. Basher, T. Holloway, T. Quarendon, G. Hepburn, D. Busuttil, R. Holloway, J. Kirk 10, J. Morris 6. Subs used: D. Cerketa 5, B. Borg, R. O’Brien 5, N. Gatt, J. Galea, M. Spiteri, I. Bezzina, J. Debattista. Cyprus: D. Grigoriou, M. Zakakiotis, C. Kasabi, A. Antoniou, J. Bilton, Y. Blond, C. Joannou, L. Frixou, G.Shaouna, A. Zavallis 3, P. Nikolaidis, S. Emery, G. Agathokleous, A. Fell, M. King. Subs used: M. Maratheftis, M. Vasil.